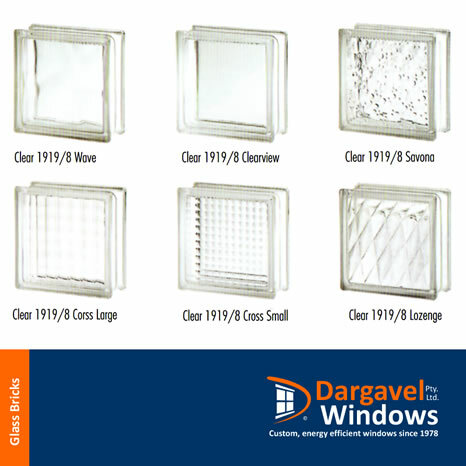 Common related products manufactured by Dargavel Windows. We supply & install the ‘Marquis’ range of fully framed pivot showerscreen doors. Pivot doors enable larger door openings than traditional sliding showerscreens. A range of designs are available to suit most bathroom layouts. All showerscreens are made to order ensuring a perfect fit every time. Available in all the powdercoated colours & Bright Natural which is a polished chrome look. 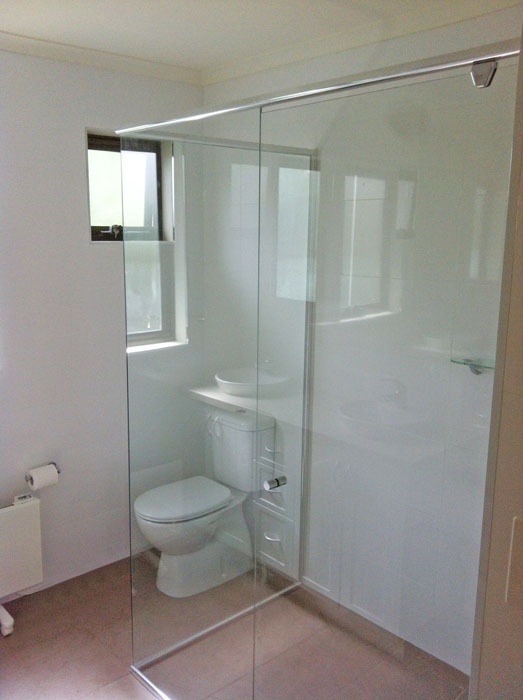 Clear glass gives an open feeling to a bathroom or obscure glass can be used for privacy. The ‘Marquis’ showerscreen is a great option that is highly waterproof with a robust design at affordable prices. ‘Mirage’ semi frameless pivot showerscreen doors are the modern trend for bathroom & ensuites in todays homes. Having a slimline frame around the perimeter only with the door being fully frameless with the vertical edges polished glass. Doors pivot on a stainless steel pin with a low friction closing mechanism to align the doors with the side & return panels. Available in all powdercoated colours & Bright Natural which is a polished chrome look. Custom made in a range of designs to suit the individual design of your shower enclosure. Combined with clear toughened glass & a minimal amount of frame these showerscreens give an open uncluttered look at a fraction of the cost of fully frameless showerscreens. 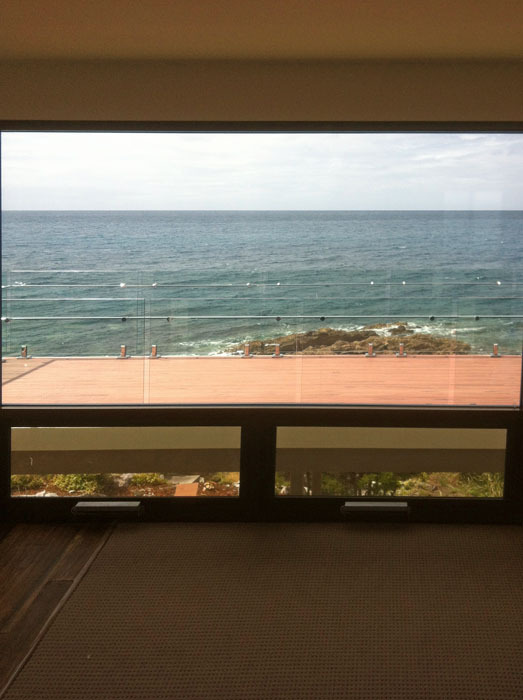 Frameless showerscreens & panels include a whole range of options. The main type would be fixed 10mm toughened panels fitting into a channel on the wall & floor leaving an opening with no door to access the shower. Plenty of slope on the tiled floor is critical to keep excessive amounts of water from escaping on the bathroom floor. 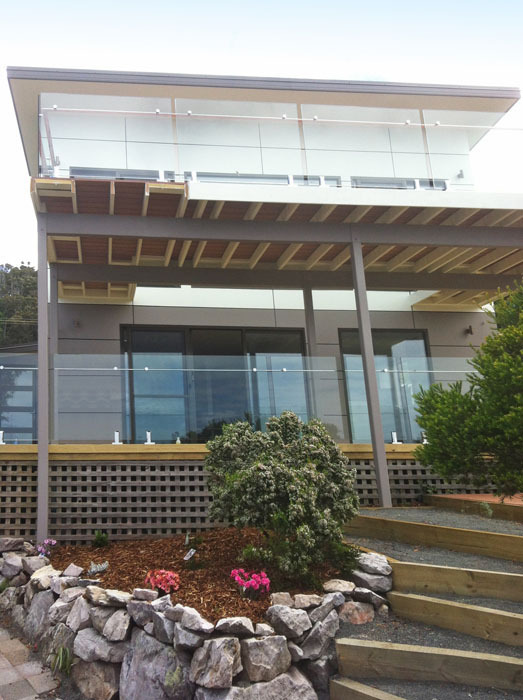 A brace may be required from the top of the glass back to the opposing wall depending on the panel size. The glass can also be fitted for the floor to the ceiling. Our range of wardrobe fronts not only operate easily & quietly day in & day out but are a great way in helping with home décor. Our wardrobe doors come with a range of inserts. Vinyl back mirrored doors are the most popular & are mainly used in bedroom situations making the room seem larger & lighter. Flexiclad is a plaster sheet with a durable easy to clean vinyl coating applied to one side of the panel. It comes in a range of colours & complements any interior design. Flexiclad is mainly used in laundry & linen cupboard situations but can be combined with mirrored doors in bedrooms. Polytec is our 9mm MDF wardrobe insert range. Like the Flexiclad it comes in a range of colours & also a timber finish to complement any interior. 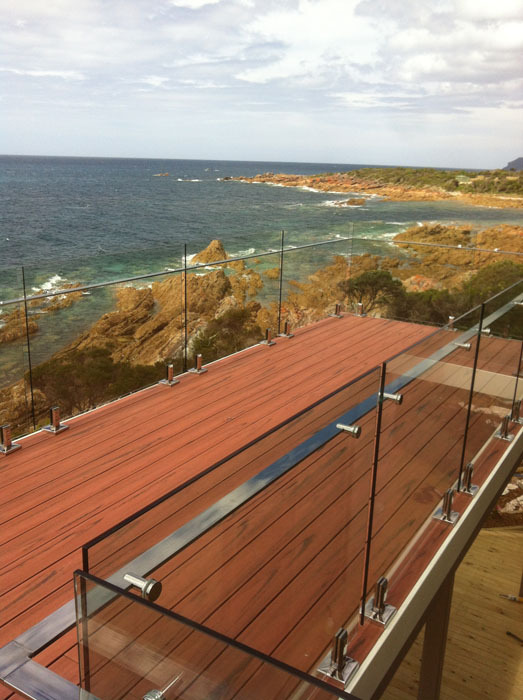 Polytec is highly durable & stylish at the same time. Polytec is mainly used in laundry & linen cupboard situations but can be combined with mirrored doors in bedrooms. Any combination of inserts is possible. The aluminium frame of our wardrobe doors come in all powdercoated colours. The frame dimensions are 73mm wide. All doors come with top & bottom tracks & wall jambs. Return jambs are also available. When carpet is to be installed it is often a good idea to fit a 19mm piece of timber onto the floor then fit the sliding track on top of the timber so that the doors clear the carpet easily. Wardrobe door fronts are custom made to your requirements. If supplying sizes please make sure that you allow for any floor finishes. We also offer a fitting service to customers in our local area. Our brochure can be viewed below. 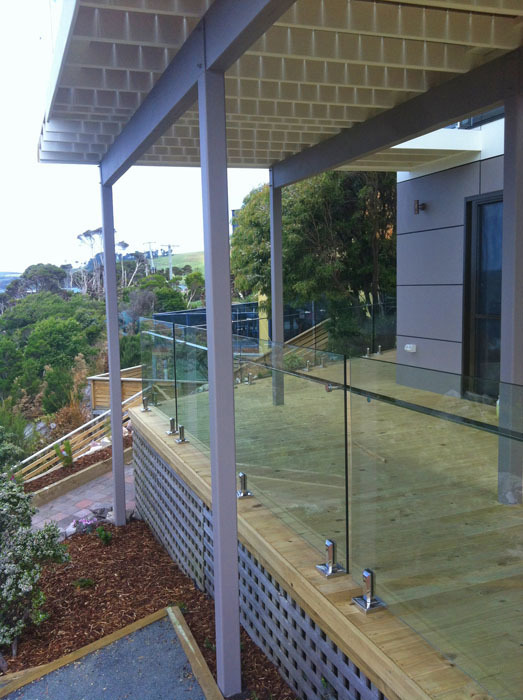 Dargavel Windows supply & install Clearspan glass & aluminium balustrades in our local area. 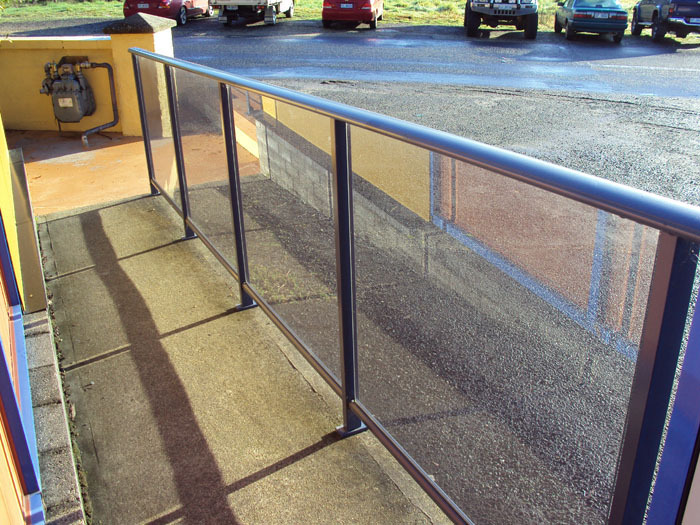 Aluminium & glass balustrades offer strength & durability with none of the corrosion or maintenance problems that some other materials have. 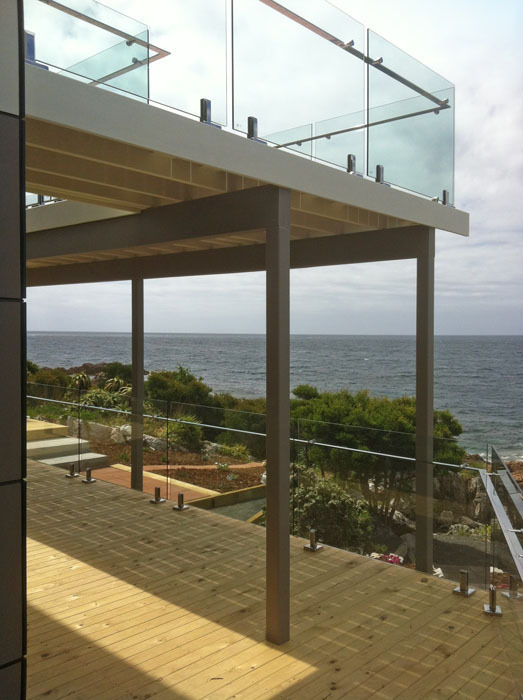 With all these attributes the aluminium, with its slim profiles & low visual impact, provides a sleek & elegant look. 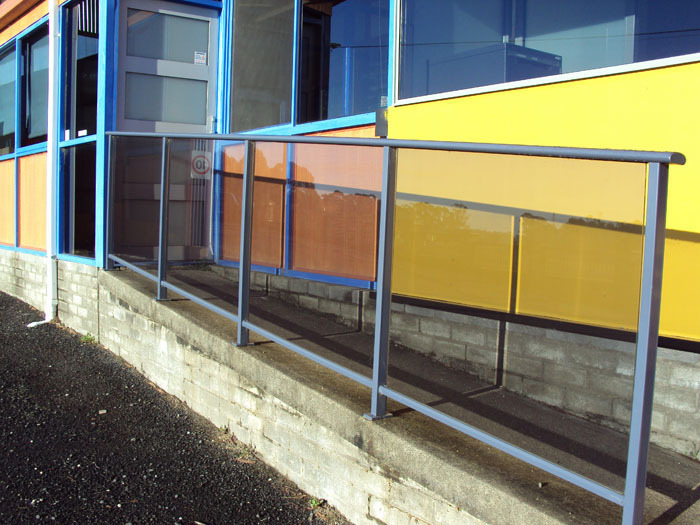 The aluminium top rails, posts & bottom rails, which can be powdercoated in our full range of colours, are perfect for any condition. 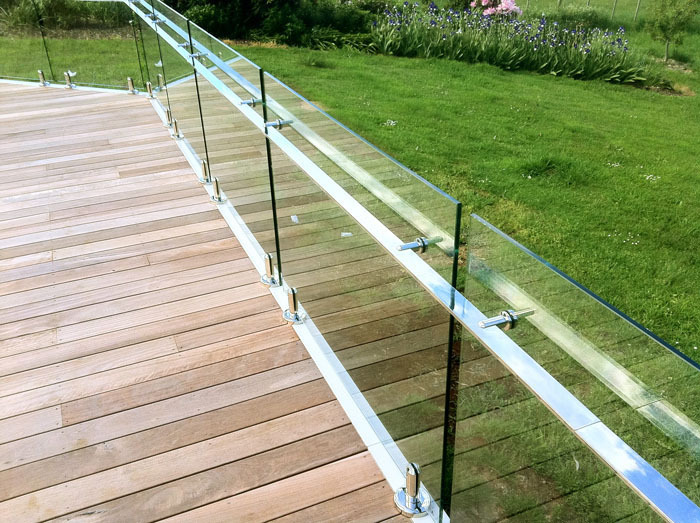 The grade A safety glass used in Clearspan balustrade not only provide the necessary safety aspects but also helps with providing some shelter from wind & rain whilst keeping your view intact. 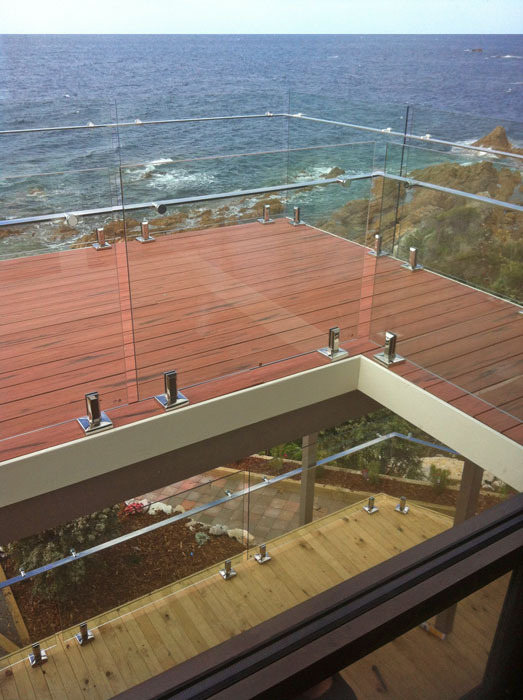 Glass is available in either clear, grey tinted or white translucent laminate. 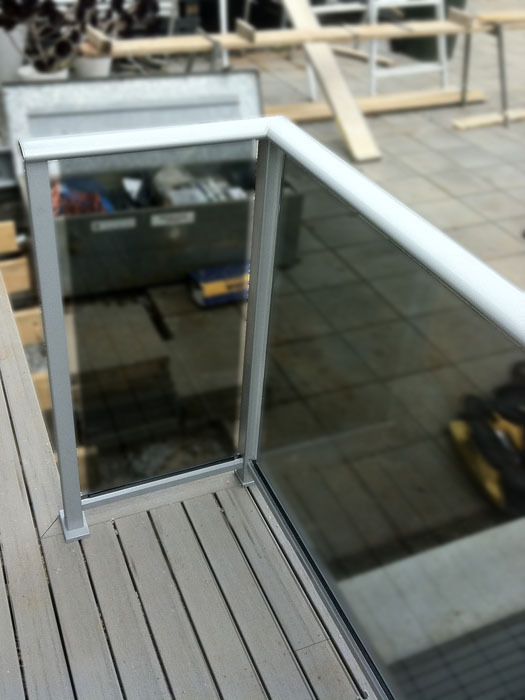 The glass is fitted into the top & bottom rails, with a gap between the posts. The edge of the glass that is exposed has a polished edge. All fittings used to attach the posts are stainless steel. 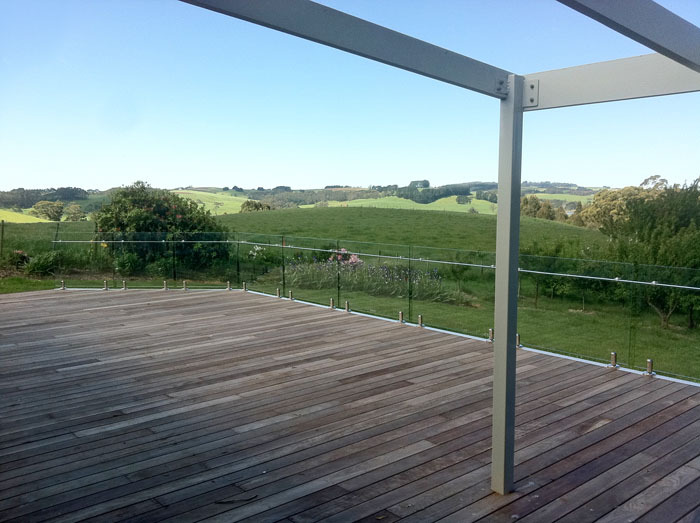 The slimline curved top rail (30mm high x 79mm wide) & low profile bottom rail (30mm high x 35mm wide) will have minimal effect on views. The 40mm wide x 51mm deep post attached to a 14mm thick x 60mm x 100mm base plate provide all the strength required to resist both wind loads & human impact regulations. 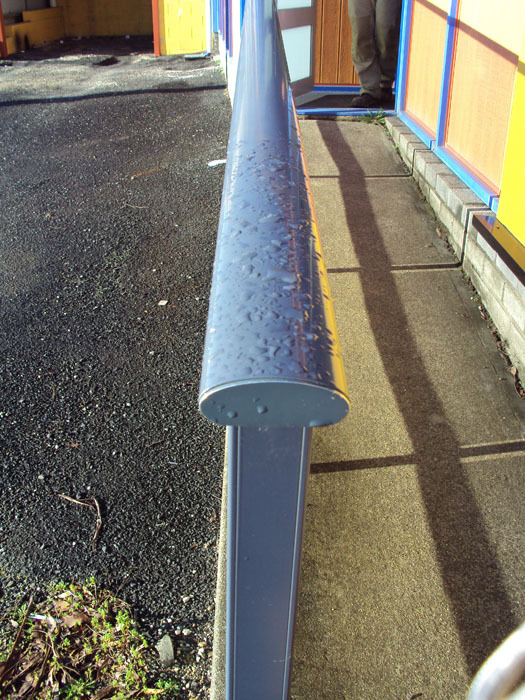 Posts are installed at a maximum of 1200mm apart. 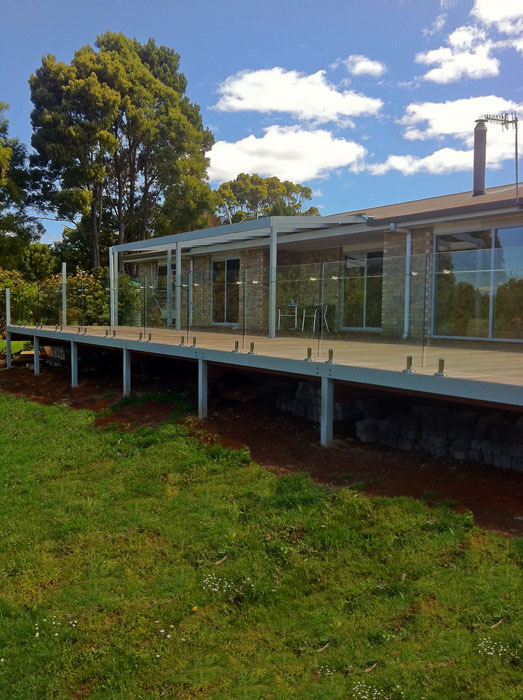 It should be noted that under the building codes & Australian standards all balustrade protecting a difference in level of more the 1000mm must have a top rail. 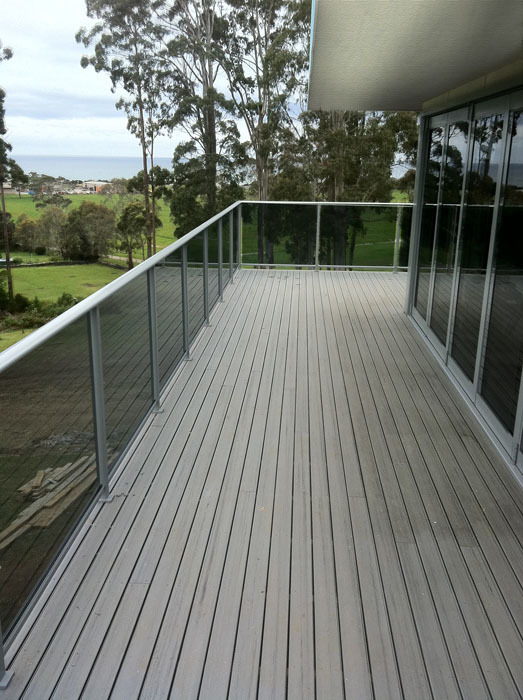 Other balustrading systems are available but all will increase in cost compared to the above. Glass bricks are a terrific way of creating a feature in bathrooms, ensuites & entrance ways. They can also provide a way of letting light into a room without compromising privacy. We offer a large variety of patterns, colours & sizes. Our standard brick we use is the Wave design which we keep in stock. Any other designs or if coloured bricks are required are an extra cost. Smaller sized glass brick frames will be delivered glazed in the aluminium frame ready for installation. For larger glass brick frames the aluminium frame will need to be installed first. Once this is done we will then come out onsite & install the glass bricks. 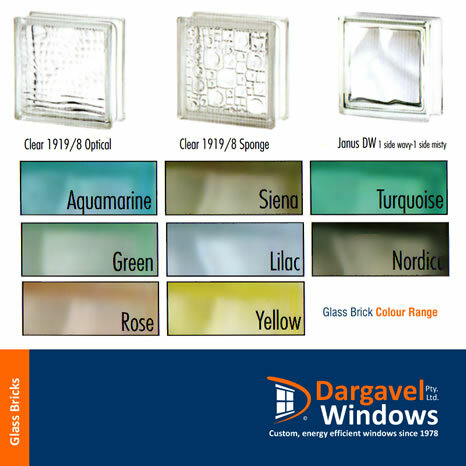 Glass brick frames come with standard reveals attached exactly the same as any other domestic window. The aluminium frame comes in all powdercoated colours. The frame dimension is 80mm x 30mm. To see the range of designs & colours a brochure can be viewed below. A Range of External Architraves are available to suit our Windows & Doors. They can clip on to the frames before Installation or be riveted on after the frame and cladding have been fitted. We supply 2 styles, Standard and Colonial, both are 90mm wide. They can be painted in the same colour as your windows or in a contrasting finish. A range of Federation style trims and wide Sill add-ons can also be supplied.